Even so, in their rush to ride Radiator Springs Racers, most of the tens of thousands of guests running daily down this ersatz Route 66 probably never notice some of the subtler touches Disney’s Imagineers infused the land with. Next time you visit DCA, why not slow down and savor five of my favorite but easily overlooked elements of Anaheim’s hottest attraction. 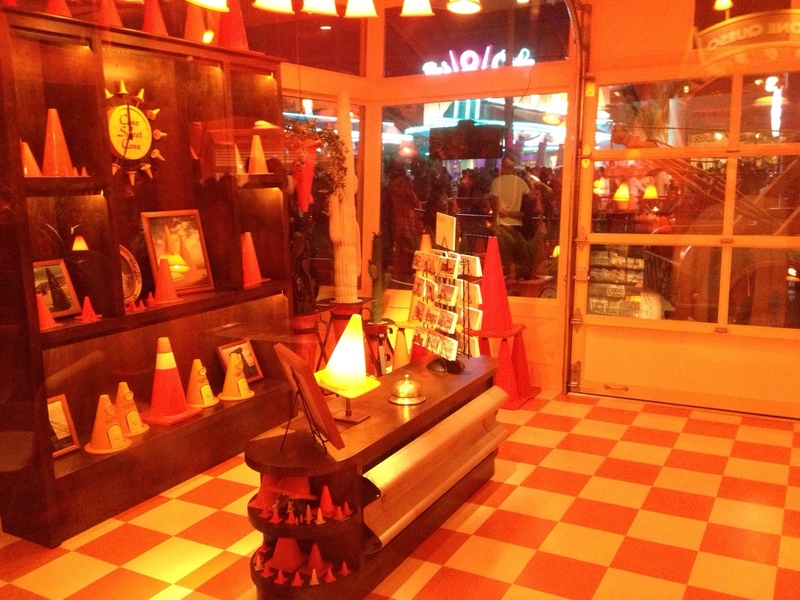 Most guests going to the Cozy Cone Motel aren’t looking for a place to sleep — there are sadly no rooms for rent — but a Red’s Apple Freeze to slurp (known as LeFou’s Brew in WDW) or oddly-flavored popcorn to munch. As a result, no one ever enters the motel office, but that didn’t stop the designers from decking it out with detailed decor, down to the faux postcards on the souvenir rack. While peeping in through the windows, keep an eye out for a certain Space Ranger star of another Pixar franchise; he’s hiding in plain sight, in a sly tribute to a scene from Toy Story 2. When speaking of Pixar, director John Lasseter’s name is mentioned most, followed perhaps by company founder George Lucas and long-time owner Steve Jobs. But not to be forgotten is Ed Catmull, the current president of Pixar and Walt Disney Animation who started as a computer scientist and went on to win Oscars for developing RenderMan software and other CGI innovations. Catmull may not have a coveted window on Main Street USA, but he has the Cars Land equivalent. 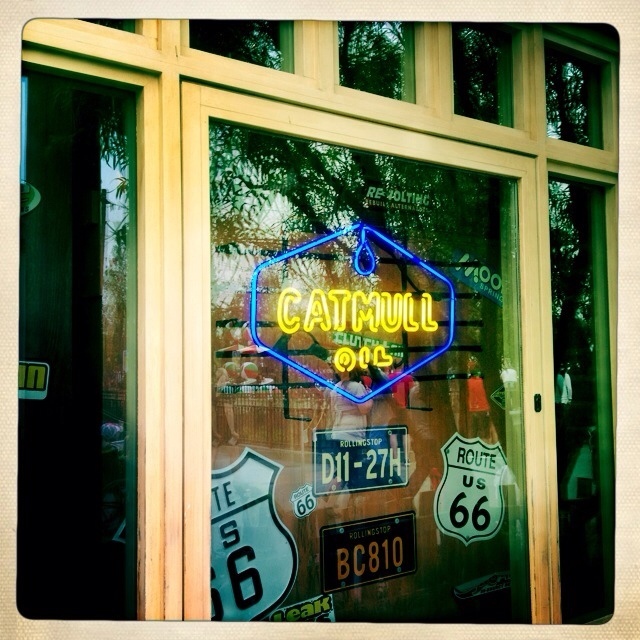 This neon tribute hangs in the window of Radiator Springs Curios, facing Luigi’s Flying Tires. Take a look and tip your hat to a man who helped invent digital effects. Flo’s V-8 Cafe, in addition to offering unexpectedly upscale entrees and exceptionally ugly pies, boasts a collection of curios that flesh out the back stories of some favorite Cars characters. One side of the seating area displays mementos from Flo’s career as a Motown singer; the other holds a museum of Doc Hudson’s history. 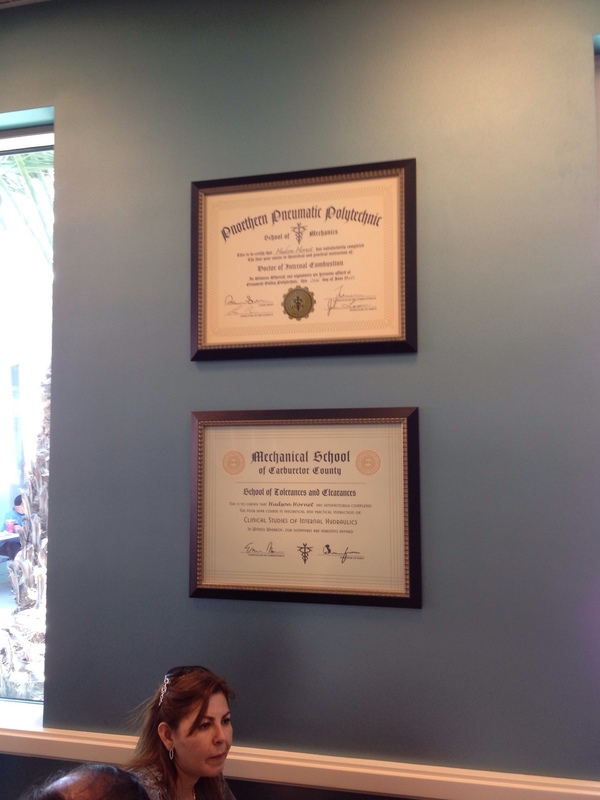 My favorite among Hudson’s artifacts are the pair of diplomas that prove he earned his Doctorate in Internal Combustion from the prestigious institution Pnorthern Pneumatic Polytechnic, with a certificate in Clinical Stufies of Internal Hydraulics from the Mechanical School of Carburetor County. Who knew — I thought “Doc” was an honorary title! 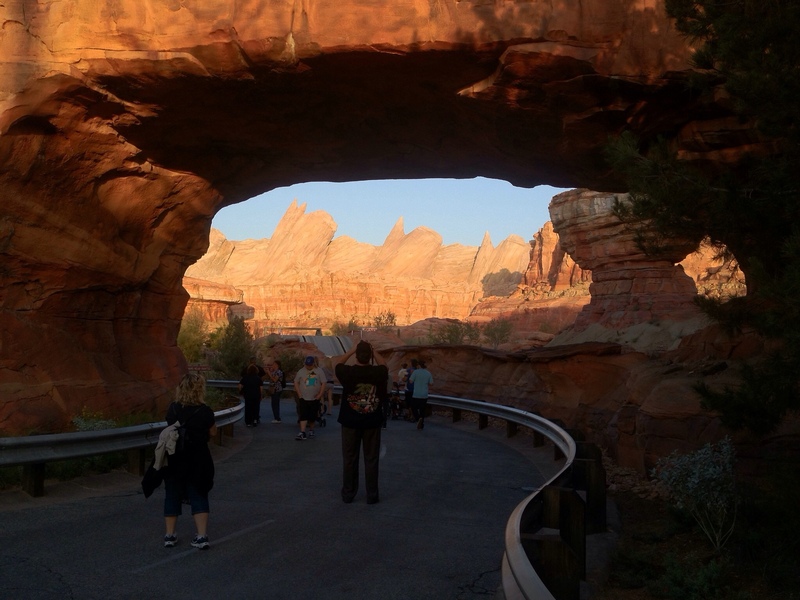 It’s a stretch to call one of a land’s major entrances “hidden,” but it’s true that the vast majority of guest go in and out of Cars Land via the main entrance across from the Golden Valley Winery. A second entrance provides a shortcut to a bug’s land and Tower of Terror, while giving a good glimpse of guests on Luigi’s Flying Tires (which may be more fun than the actual ride, depending on the wait time). Speaking of magic hour, the moments after each sunset see a magical transformation of the already magnificent land. As twilight approaches, the strains of the 1950’s do-wop classic “Sh-Boom (Life Could Be A Dream)” float through the air. One by one, the buildings along Route 66 spring to life in glowing neon colors, and the entire street slowly illuminates for the evening. The nightly neon ignition is a not-to-be-missed experience that often sees crowds spontaneously dancing and singing along in the street. But you wouldn’t know anything about from the official show schedule published on Disneyland’s website. For some odd reason the irritating DJ Dance n Drive Party merits an online mention, but the lovely lighting ceremony goes unadvertised. Fear not, you can count on the event occurring every evening at about 5 minutes past official sunset. 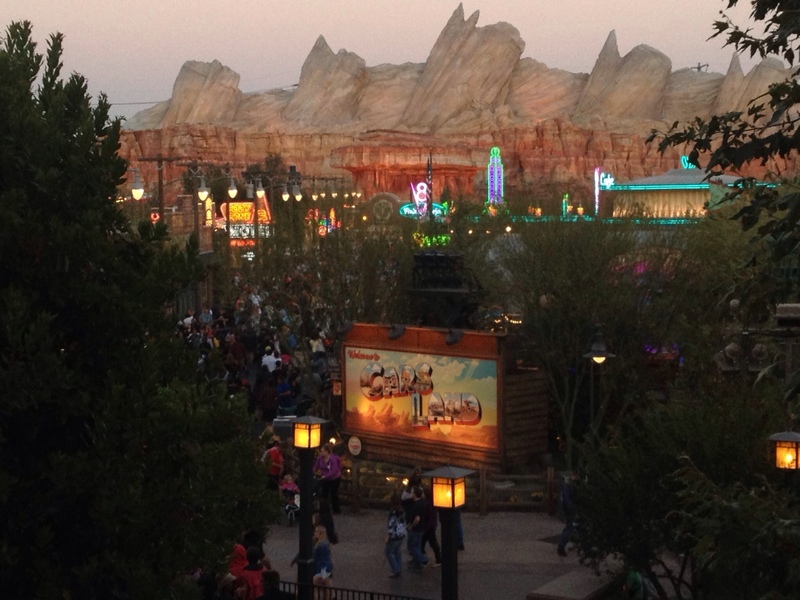 If unsure, ask any cast member in Cars Land what time tonight’s neon ceremony will be held. Keep in mind that, depending on the time of year, sunset may be many minutes before it actually gets dark out. Enjoy this video I shot shortly after Cars Land’s grand opening, and let us know in the comments what your favorite underappreciated detail in the area is. 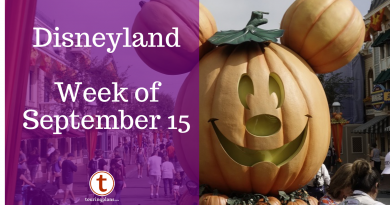 This week on TouringPlans YouTube Channel: DisneySea’s Sinbad, Be Our Guest Pork Chop, and More! September 13, 2013 Guy Selga Jr. Comments Off on This week on TouringPlans YouTube Channel: DisneySea’s Sinbad, Be Our Guest Pork Chop, and More! The neon lighting ceremony was AMAZING! My favorite part of the trip, hands down. I will admit to tearing up. I loved it! I love the couples dancing!